People who use manual wheelchairs on a regular basis end up getting a great workout along the way, unvalidating the myth that it’s harder for disabled people to get the exercise they need. That’s according to a recent study conducted by researchers at the University of Tennessee, Knoxville’s Department of Kinesiology, Recreation, and Sport Studies and published in the Adapted Physical Activity Quarterly. The study found that people who use manual wheelchairs burn tons of calories while doing normal daily activities, not to mention when they exercise. They burn more than those who use electric wheelchairs and nearly as much as non-disabled people who perform the same actions. This is great news for anyone who uses a wheelchair and is worried about how they can stay in shape and get all the exercise they need. It proves that having a physical limitation doesn’t have to limit your ability to get fit. Resuts found that people who use a manual wheelchair on a flat surface going 2 miles per hour can burn up to 120 calories, which is three times more than someone would burn doing the same action in a motorized wheelchair. To formulate the study, its authors reviewed more than 250 other studies that looked at wheelchair-related physical activities. Overall, more than 63 activities were evaluated, from sitting still to mopping the floor to perofrming moderate exercise. According to the Departemnt of Health and Human Services, disabled people should get at least 150 minutes of moderate exercise or 75 minutes of vigorous exercise each week, which is the same for non-disabled people. However, most people think it’s harder for disabled people to get enough exercise, because they’re sitting the majority of the time, as opposed to more able-bodied people. But, as the study proves, that’s not necessarily the case. 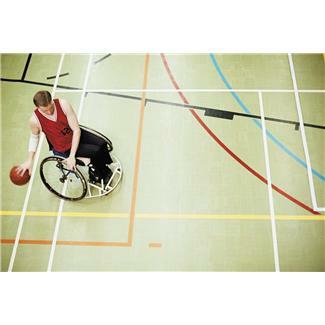 As the study points out, a disabled person can get in all of their exercise for the week by playing a game of basketball with some friends, by vacuuming and dusting the house, or by using some easy machines at the gym. The study is a great resource for any wheelchair users who want to get healthier and for any phsycians or physical therapists who need to help get motivated and get into better shape. It shows that disabled people don’t have to go above and beyond to get the physical exercise they need. There are several types of wheelchairs out there, such as invacare wheelchairs, that can keep disabled people comfortable and safe while getting around and getting your daily exercise. And if you need to focus more on exercise, it’s probably better to opt for a manual wheelchair as oposed to an electronic one. But regardless of the type of wheelchair you use, you should be sure to get your daily exercise in any way you can, whether it’s by taking a stroll through the neighborhood, cleaning the house, or playing ball with some friends. Lisa Hausler writes about fitness and health topics, including how the disabled can get the exercise they need by having a great wheelchair, such as Invacare wheelchairs.